Hey, the first international ski races of the 2011-2012 season took place recently in New Zealand! They are officially FIS sanctioned races, but my impression is that they have a bit more of a training camp time trial feel to them. The Americans, Canadians, some Russians, and then an assortment of Japanese, Korean, and locals (Australia + New Zealand) are spending time down at the Snow Farm. The fields are small, no one is in top form and probably everyone is treating them as training rather than a ‘serious’ competition. 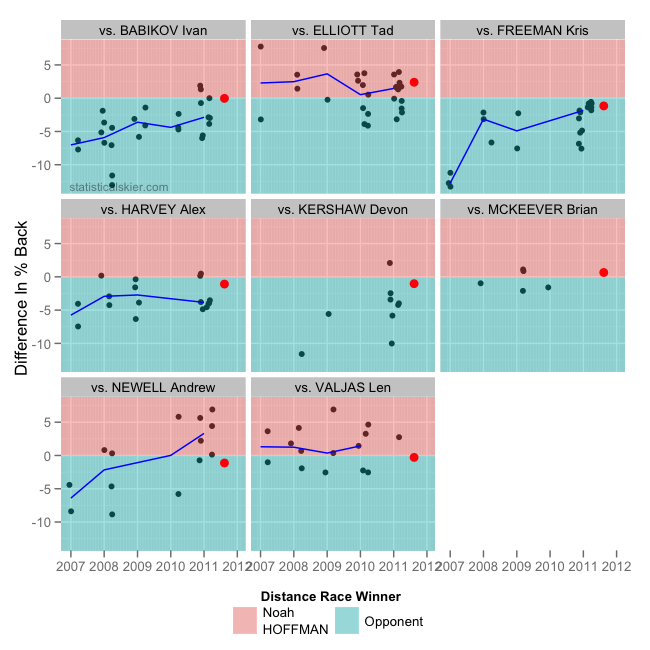 This graph shows how Hoffman has fared against these specific skiers (a subset of the folks in the New Zealand race) over time. The New Zealand race is in red. That appears right in line with how he fared against Freeman last season, so that’s a good sign. In general, he’s been faring better against Newell over time, but this particular race was a bit against that trend. Given that Hoffman was about as far behind Freeman as he normally is, I’d guess that’s evidence for this being a strong race for Newell rather than a weak one for Hoffman. The corresponding women’s 10k classic mass start was interesting for data nerds like myself. It consisted of Justyna Kowalczyk and only 5 others (it’s possible other folks raced who don’t have valid FIS licenses, so they won’t show up on the official results) from Japan, Korea and New Zealand. Obviously, this made for a somewhat uneven field. Kowalczyk won by around 4 minutes. This immediately gets someone like me wondering how that margin of victory stacks up historically. In this case, second place finisher Sumiko Ishigaki was ~13% back. That’s the third largest percent back by a second place finisher that I could find in a FIS sanctioned women’s race (out of 2691 total). That means that I found two races with larger margins between first and second place! Posted by Joran on Friday, August 19, 2011, at 6:00 am. Filed under Cross Country, Head-To-Head. Tagged continental cup, Distance, justyna kowalczyk, new zealand, noah hoffman. Follow any responses to this post with its comments RSS feed. You can post a comment or trackback from your blog.